"The quality management system for the design, manufacture, calibration, repair and supply of electronic measuring equipment ". 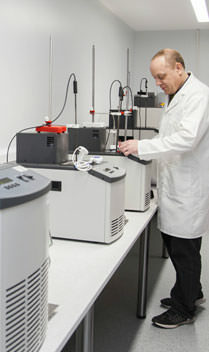 Our UKAS accredited, UKAS Laboratory, is equipped with the latest in thermometry technology including Fixed Point Cells, Calibration Baths and sophisticated 'Super Thermometers'. Our Sales Staff will advise on the current status of our UKAS Schedule. Electronic Temperature Instruments Ltd are officially BSI ISO9001 registered and now have the certificate to prove it! Tom Harland congratulated Electronic Temperature Instruments Ltd on achieving registration to ISO9001 with BSI and said; "Your registration has positioned your business among the world leaders in demonstrating a commitment to the provision of quality products and services. "I would like to put your success into perspective, ISO9000 is recognised in 93 countries around the world, there are approximately 160,000 registrations to ISO9000 in the world with some 50,000 in the UK. BSI are the world leaders in ISO9000 registrations." "ISO9000 is being applied in almost all sectors of business for example: engineering, automotive, aerospace, chemical, pharmaceutical, construction, computers, banking, health, food, agriculture, horticulture, retail and many more. The certificate is geographically very strong and well established with BSI being proactive in Europe, Scandinavia, North America, South East Asia, Eastern Europe and South America. "I believe your products can be applied on a worldwide basis to most of the business sectors currently using ISO9000 and in due course ISO14000 the Environment Management System." "Peter Webb is so committed to improving ways of working, he regularly submits ideas to David Carter for consideration. This approach is exactly what this international standard seeks to achieve and acts as a clear demonstration of your collective commitment to quality of product, service and commitment to excellence." ETI Managing Director, Peter Webb, said: "Our partnership with BSI means that we are able to include the coveted BSI logo on our documentation - a boom to sales in general."